EnviroLink Forum • View topic - Gosh, whatever happened to all that warming recently? Gosh, whatever happened to all that warming recently? Post subject: Gosh, whatever happened to all that warming recently? Gosh golly you might want to check out here. The old graph has been taken off line so I substituted a new link that has a similar graph. Last edited by Dingo on Thu Oct 02, 2014 7:35 am, edited 5 times in total. Post subject: Re: Gosh, whatever happened to all that warming recently? Even with oceans taking most of the heat, the surface temperatures are heading toward 2014 being the hottest year in recorded history. This is the first year ever of the methane blowhole phenomenon (16 of them from smaller to very large and deep). The methane monitoring org has more coming out of the oceans at this time and tundras rapidly catching up, especially with the huge spikes caused by the blowholes. By the 2030s every year will be a new record, until there is no one left to report, except perhaps those in underground fortresses. Those underground forts will not outlast a Permian style or worse extinction we are heading for. They would last and become the seed of humanity, if we blow Yellowstone for a geologic bottleneck and cool down to late interglacial norm. Whether there is going to be this big methane blowout in the future remains to be seen. But here graphed out is the rise of various ghgs since roughly 1975. Methane seems to have accelerated the fastest during the early decades. Gosh, this must be a mistake!!! 18 Sep 2014 4:56 PM "On the tails of the hottest May, one of the worst droughts in U.S. history, some of the earliest big hurricanes ever, and just generally one of the weirdest years of extremes, we now have the hottest August on record. NOAA announced that the global temperature average for August 2014 was 61 degrees Fahrenheit. Now that’s no sauna — what do you expect, it’s already PSL-season and half the planet is still shivering through a sub-equatorial winter — but it seems especially toasty when you realize that average includes both land and sea temperatures. 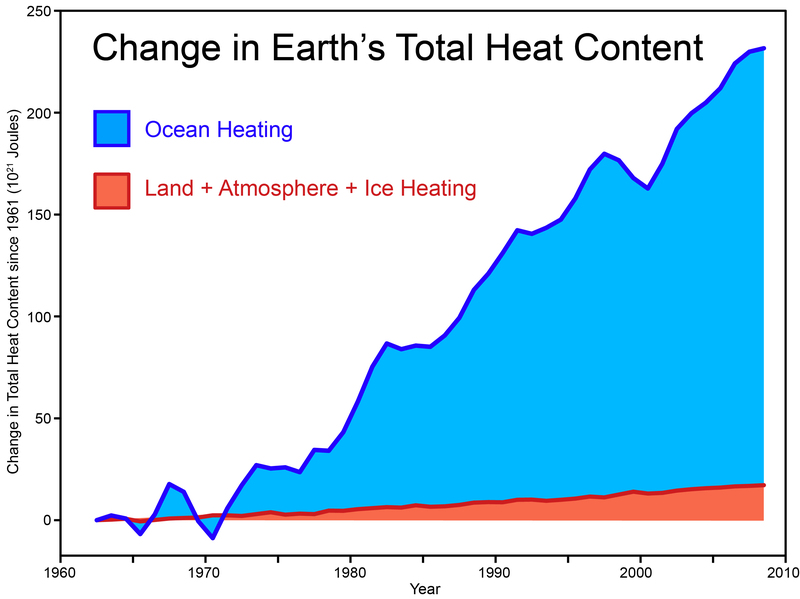 In fact, this was the hottest month in the oceans EVER." Will 2014 be actually statistically or measurable warmer than previous years? Or will it be only in the thousandths of degrees? The predictions of AGW made in 1998 by the IPCC have not happened. How long do we need to have no significant warming until the hypothesis of catastrophic CO2 induced warming becomes clearly disproven? If it cools in the next 5 years by 1/2 a degree will that show that we do not need to worry? If not what would it take? Tim the dung heaper, poor guy can't read. "Hysterics at the right wing think tanks and their acolytes at The Washington Times, talk radio and the blogosphere, are foaming in apoplexy because I supposedly suggested that “all climate deniers should be jailed.” Last week, that canard leapt from the wingnut echo chamber into New York magazine, which reported, under Jonathan Chait’s by-line, that “Robert F. Kennedy, Jr. shares the opinion that climate denial should be criminalized.” Chait was quoting the National Review’s Kevin Williamson who made that outlandish claim at one of Heritage Foundation’s annual “Conference for Kooks.” Of course I never said that. I support the First Amendment which makes room for any citizen to, even knowingly, spew far more vile lies without legal consequence. I do, however, believe that corporations which deliberately, purposefully, maliciously and systematically sponsor climate lies should be given the death penalty. This can be accomplished through an existing legal proceeding known as “charter revocation.” State Attorneys General can invoke this remedy whenever corporations put their profit-making before the “public welfare.”"
I guess the poor idiot missed this post, too. It’s hard to say for certain that some extreme weather events were caused by climate change but scientists are pretty confident about the connection in other cases. That’s the conclusion of a report released today by the Bulletin of the American Meteorological Society, which included 22 studies by 20 research groups who assessed 16 different weather events that took place in 2013. The answer is most likely yes. We will not know until 2015 though. That could be quite a while as the current warming can be statistically significant in sufficient time. That would depend on the reason for the cooling. The eruption of a mega-volcano cuold have such an impact and there would still be a lot of reason for worry. A reversal of the laws of physics? "The data show that the Earth’s climate was on a long cooling trend in the Paleocene, associated with removal of CO2 from the atmosphere and burying it in sediments, deposits of peat, permafrost and methane hydrates. Those carbon reserves were like deposits in a bank account – available for withdrawal later. The first signs of warming began around 58.9 million years ago associated with a sharp jump in ocean bottom water temperatures (known as the “ELPE” - Early Late Paleocene Event), followed 1.2 million years later by a more steady warming trend that underpinned regular cycles of hotter and cooler climate (those hot flashes that we call Hyperthermals). The clue is in the regularity of the fluctuations. Scientists combined radiometric dates on volcanic ash layers with the record of Earth’s magnetic reversals and the known cycles in Earth’s orbit, to correlate the sedimentary records at the different locations. This also allowed a mathematical assessment of the correlation between the climate cycles recorded in sediments and Earth’s orbital cycles. There are 3 different kinds of orbital cycle that control the intensity of sunlight on Earth (solar insolation): eccentricity, precession, and obliquity – for more about them see this post. The 3 papers show that the Hyperthermals and their effects were global, and were paced by orbital eccentricity on cycles of 405,000 and 100,000 years, and also by orbital precession (21,000 year cycles). The longer eccentricity cycles are associated with ocean bottom water temperature swings of up to 2-4°C (4-7°F), while the 100,000 year cycles correspond with 1.5°C (3°F) swings in bottom temperature. There’s very little contribution from the obliquity (41,000 year cycle) probably because there was very little ice at the poles at the time (unlike during the Pleistocene ice age, when obliquity was much more prevalent). In the oceans these cycles show up as regular variations in carbon isotope ratios (reflecting carbon cycle changes) and oxygen isotope variations (reflecting ocean temperature) and the proportion of “Coarse Fraction” or Iron intensity in sediments (reflecting carbonate dissolution and sediment supply). Littler et al’s study would seem to concur. They found that ocean bottom temperatures lead the carbon cycle by around 6 millennia for the 405,000 year cycles (less in the Paleocene, more in the mid Eocene) and about 3,000 years for the 100,000 year cycles. This indicates that the ocean carbon signal in orbitally-controlled climate change is a feedback response to orbitally-driven temperatures. In contrast, today’s climate change is not orbitally-driven – if it were we would be experiencing global cooling, not warming. It has also taken place in a time frame just 3% of even the fastest orbital cycle. "As was the case during the Paleocene, our modern Earth has reserves of permafrost and methane hydrates that were ‘banked’ during the cool Pleistocene ice age all the way up to the pre-industrial era. And even though some interglacials may have been warmer than the preindustrial era, deep-ocean temperatures appear to have been only slightly elevated, keeping most deep sea methane locked away - until now. A Paleocene-to-Eocene-like methane release is expected from modern climate change because the deep oceans are now warming by a magnitude unprecedented in the past several million years! due to the far more abrupt nature of modern carbon emissions and warming." So I guess I am just an "envirometalist" like Milton B thinks. Climate Central is saying the first 9 months of 2014 were the warmest on record and most likely 2014 will be the hottest year ever. You know we have the Arctic methane Emergency Group, so why don't the idiot denialists bother to read the posts and links? So they can keep their garbage in themselves or throw it out totally? Ignorance is bliss. Microbe is seen everywhere. We can't live without them but they are fine without us. I wonder if even the thermal vent extremophobes will be able to live through the global terminal extinction events that we are on track toward. Methane Apocalypse, Everything Else Is A Distraction. We know volcanic and human burning aerosols dim the Earth and reduce temperatures. I thought the mid '90s were bad, but now we have a few more volcanoes with their TEMPORARY effect of cooling. "A new study has found that when particulates from small volcanic eruptions are properly accounted for, volcanoes may be responsible for much of the slowdown in global surface warming over the past 15 years. Sulfur aerosol particulates pumped into the atmosphere from volcanic eruptions cause short-term cooling by blocking sunlight. Until recently, climate scientists thought that only large volcanic eruptions had a significant impact on global temperatures. There haven’t been any big eruptions since Mount Pinatubo in 1991. However, studies published over the past few years have found that even moderate volcanic eruptions can pump significant amounts of aerosol particulates into the atmosphere. Virtually all research into the climate influence of volcanic aerosols has used satellite measurements of particulates in the upper atmosphere (the stratosphere). These satellite measurements only monitor the volcanic aerosol at heights of 15 km and above. The new paper by David Ridley and colleagues studied the amount of volcanic aerosols in portions of the stratosphere that lie below 15 km."